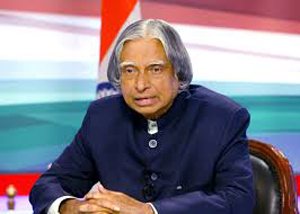 New Delhi, July 28, 2015: The Government has announced a seven-day state mourning in honour of former President APJ Abdul Kalam, however, there will be no holiday. "As a mark of respect to the departed dignitary, seven days of state mourning will be observed throughout India from July 27, 2015 to August 2, 2015, both days inclusive," an official statement said. However, all central government offices will remain open and no holiday has been declared. During the period of state mourning, the national flag will fly at half-mast on all buildings throughout the country where it is flown regularly and there will be no official entertainment. The date, time and venue of the state funeral will be intimated later, it said. Dr Kalam, who would have turned 84 in October, died after suffering a massive cardiac arrest during a lecture at the Indian Institute of Management Shillong yesterday.